The University Climate Change Coalition (UC3) is an ensemble of research universities that are venturing outside their campuses to connect with local businesses, governments, and communities to accelerate the transition to a low-carbon future. This blog post is part of a series highlighting the climate action work of UC3. Up next is the State University of New York. The sun is Earth’s greatest source of energy, and we are still utilizing solar energy captured by ancient plants and animals, which formed fossil fuels after decaying and being exposed to millions of years of heat and pressure. Due to necessity based on research from scientific experts, our energy extractions are now turning toward renewable options. 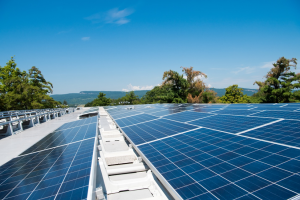 The State University of New York (SUNY) is helping NYS’ communities through the institution’s impressive work in energy ingenuity and sustainability, and now, even more so with its UC3 cross-sector participation. Its leadership in the renewable energy frontier encompasses not only solar, but wind, water, nuclear, geothermal, and bio-energy as well. SUNY is on the path to source 100 percent of its grid supplied electricity from zero-net-carbon sources, including renewables and energy storage. Researchers at SUNY are finding energy alternatives to fossil fuels and developing long-lasting batteries. Inspired by the energy transfer process of photosynthesis, they’ve also discovered a mechanism to help make sustainable solar energy a reality. 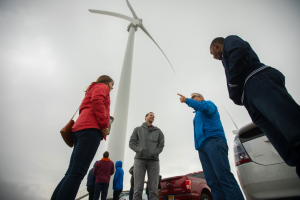 These practical resources, and more, are a part of what SUNY brings to UC3, and these connections will spark a needed surge towards renewables. In the broad arena of climate change action, many sectors—academia, businesses, nonprofits, houses of faith, and state and local governments—are involved and working toward a shared goal of a low-carbon future. Research universities involved with UC3 are stepping up and acting as convening spaces for the different sectors to communicate and organize productive advances in climate resilience and planning. SUNY is the largest comprehensive system of higher education in the United States, with 64 college and university campuses, and given that a campus exists within 30 miles of every home, school and business in the state, SUNY schools are conveniently located to connect climate change action in communities. One way is through forums that draw together the diverse sectors for an intensive workshop and space for collaborating and planning. Read the interview below to find out more ways SUNY is connecting and energizing the way forward in sustainability and climate resilience. Why do you think the University Climate Change Coalition is significant? While each of our schools is unique, they all share many similarities in the makeup of their campus community and the interactions with their surrounding communities. While they can continue to function independently as they have in the past, creating partnerships and working together across cities, states, and countries makes higher education an even more powerful force for change. UC3 is a great way to develop those partnerships and commitments to combat the threat climate change poses to us all. The collaboration has also created a platform for higher education to set its ambitious climate goals as a collective force. What were some of your goals going into the cross-sector forum? Was there anything about the planning or execution of the forum that surprised you? SUNY has been holding a major cross sector forum most years since 2007, the Advanced Energy Conference (AEC). This event, which attracts more than 1,500 participants, brings together government officials from local and state levels, students, academics, and researchers from universities across the country and industry partners to look at all aspects of energy and connect with one another. What were the important outcomes of the forum to you? What was your biggest takeaway? Any interesting comments from participants that were unexpected? Advances in technology continue to accelerate and produce a multitude of options for managing energy. What I found interesting is existing buildings consume roughly 35 quads of energy, and it is estimated 13 quads could be saved with better sensing technology. As it stands, implementing that technology continues to be a massive challenge, but New York State is taking the lead in solving for this through a state-wide platform from the New York State Power Authority called New York Energy Manager, which will include measurement and verification, virtual energy audits, constant commissioning, data analytics, and asset data collection. Additionally, implementation of micro grids and their impact on the quality of electricity is leading to extensive research and advancement in energy storage and grid power conditioning controllers, which is important information to share. Who attended your forum (stakeholders)? What were some of the climate priorities identified? What do you envision for the future with this groups of stakeholders? We had a great turnout! The forum was attended by officials from both State and local government, academics, researchers, facilities staff, sustainability staff, energy managers, students, and industry partners in all areas of energy management and sustainability. The climate priorities have been set by Governor Andrew M. Cuomo, including 100% clean energy for the State of New York by 2040, and 100% renewable grid sourced electricity for SUNY as soon as possible among others. These stakeholders will continue to interact through future AEC conferences, and many additional events including the 2018 State of New York Sustainability conference, and we look forward to working with them. Any advice you would give other schools interested in convening external climate actors? Be broad in the invitations to cover all sectors, because each person attending will bring a unique perspective to the event. It is the blending of these perspectives that results in the best ideas and potential outcomes, which will help us leave the planet intact for future generations. We hope you enjoyed this insight into the timely and important work of UC3. For a more detailed look at their progress, view the UC3 2018 Progress Report: Research for Solutions. For more than a decade, the diverse institutions in Second Nature’s Climate Leadership Network have been pursuing carbon neutrality in campus operations, creating new climate solutions through innovative research, and preparing students to solve the urgent climate challenges of the 21st century. UC3 builds upon this effort through a specific focus on the place-based strengths of research institutions. In launching UC3, the initial cohort of member institutions has committed to mobilize their resources and expertise to help businesses, cities and states achieve their climate goals.